I have many Cold Steel products from swords, knifes, a blow gun, and the list goes on and on! As far as this Cutlass goes it is one awesome blade, and possibly my favorite one from them. It's sharp and solid and absolutely a fine blade. Perfect for close quarters use. The blued blade is not dull or drab but very shiny and has a look of it's own. When I heft it I feel very secure and safe and as far as the so called blades that say "battle ready", trust me this piece is more than "ready"!! And as always again True Swords shipping is second to none, Fed Ex tracking is easy and delivery is never over three days. Again very satisfied. Overall I am impressed with the sword, but the leather scabbard looks and feels a little chintzy for the price. After I got the coating of grease off the blade I realized that the pictures of the sword do not do it justice. The blued blade has a really nice shine. Ture Swords did a great job with the packaging, delivery time, and price. However, the greased up sword was shipped in the leather scabbord. So every time I put the sword in the sheath it gets a little bit of grease on it. I don't mean to complain, I am really glad I got the sword from you guys and I would do it again. I just received my Cold Steel Cutlass! I have swords that I've paid twice as much for and they don't match the quality of this blade, Cold Steel makes NO junk! They have videos on you-tube testing their swords. I contacted True Swords after a bad Internet experience with another vendor. I received an email the very next morning giving me answers to questions I had. 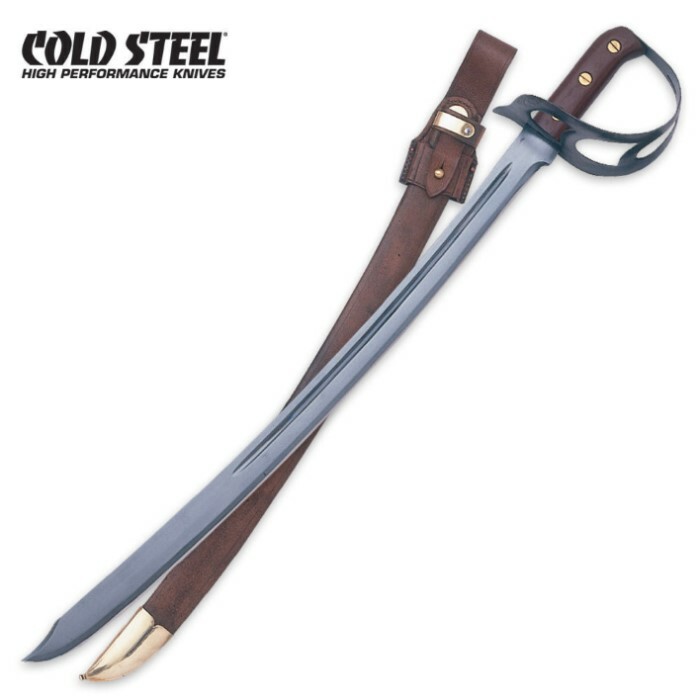 True Swords is quality oriented in what they carry and their prices are awesome, I've checked around. How they packaged my cutlass alone was worth more than the shipping I paid and I received it within a week! I don't usually write reviews, but this has been the Best internet shopping experience. True Swords fefinitely has a new fan. Yes, I'm looking to buy from them again and recommend you do to. A sharp looking blade and easy to handle also. Seems very sturdy and well worth the price. This sword rocks fast shipment,an came packed very well. The blade is sharp an it is good for any salty rouge or swashbuckler in your life.